Most kayakers who live in a cool climate find that the ideal year-round kayaking clothing is a wetsuit under a waterproof jacket, with or without a synthetic shirt or pullover. Wetsuits are made of neoprene foam, usually sandwiched between two layers of nylon to make a stretchy rubber garment 4 mm thick. See Wetsuit Material. A wetsuit should fit closely so that you wear only a swimsuit underneath. The kayaker's usual farmer John/Jane wetsuit has legs, body and shoulders but no arms and usually no collar. The suit on the left actually does have short arms, but this is not a problem because it is a very flexible summer suit with a 3 mm body and 2 mm arms. Everyday comfort: If you launch from a beach, you are quite likely to get soaked by a breaking wave. If you are addicted to exploring the coast right up close, you are quite likely to capsize and roll up. A soaking wetsuit is more comfortable than a soaking fleece garment. Confidence: If you know that getting soaked won't leave you shivering like a wet dog, you can relax and be a good kayaker. You can practice rolling in real ocean conditions, which is a very different thing to rolling in a heated swimming pool. When your friends do some surfing or a deep-water rescue exercise, you can join in. Survival: A wetsuit provides a good level of protection against cold shock, swim failure & hypothermia. Unlike a drysuit it will continue to do so even if it has a few rips or holes. Economy: A good wetsuit is not very expensive, and you can easily repair the occasional rip or seam failure using needle, polyester thread and wetsuit adhesive. Versatility: In cooler weather you can wear one or two base-layer shirts under your farmer John, and in cold weather you can wear a synthetic fleece pullover over your wetsuit, under your sprayskirt and waterproof jacket. A 3 mm wetsuit is fine for summer. Most cool-climate kayakers have a 4 mm farmer John and put up with being cold in winter. Quite a few have 5 mm farmer Johns, which are comfortable in winter and if you ever find yourself thinking "I'm too hot" at other times of year there's always plenty of cool water just by your elbow. A good, well-fitting wetsuit with waterproof seams is comfort and pleasure. A cheap one with seams that let cold water flood in and out is cold and misery. Supermarkets sometimes advertize that their wetsuits have flatlocked, overlocked or Mauser stitched seams, which is like advertizing that you have bad breath. Not only are these seams not glued, they also have at least two rows of needle holes parallel to the seam which allow cold water to flood in and warm water to flood out. 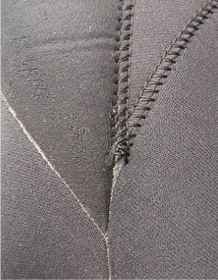 Cheap seams of this sort are typically used to assemble cheap wetsuits from many small pieces of cheap inflexible neoprene, with zippers in the ankles to make them easier to put on. The best wetsuits are made of just two or three pieces of material, which means the total length of seam is very short; and the seams are made waterproof. They are glued and then where necessary they are blind-stitched (stitched in such a way that the needle never passes all the way through the fabric) and/ or hot-air taped or sealed with a stripe of polyurethane glue. Wetsuit zippers leak, break and some eventually tear out. A kayaker's farmer John does not need any zippers as long as the design and material are good. You can get into a farmer John with no neck zipper if one of the shoulders closes with velcro. You can get your feet through the ankles as long as the edge is left raw rather than being rolled and hemmed. If you have big feet, dust them with talcum powder to help them slip through the ankles. Or put a plastic bag on each foot. Or dunk the suit's ankles in water before you put it on. Wetsuits are much stretchier when wet. Like a pair of shoes, a wetsuit will feel and perform much better if it is a good fit so we don't recommend buying one over the Internet unless it is custom-made to your measurements. A wetsuit should fit you comfortably but without any loose areas where cold water can collect when you have an accidental swim. Try sitting on the floor of the store wearing the suit and pretending to paddle. Is the suit cut long enough at the back? Does it press on your throat? Will your armpits and shoulders chafe when you paddle? You may find that none of your local watersports stores sell farmer Johns with waterproof seams. Some whitewater enthusiasts who go out all winter wear a full wetsuit with a 5 mm body and legs but thinner material for the shoulders, arms and a high collar (a board surfer's "steamer"). Steamers generally do have waterproof seams. They're great for surf kayaking, unless they have a zipper running down vertically from the back of the neck as it will eventually tear out at the bottom from constantly being worn in a sitting position. However they're too sweaty and tiring for ordinary kayaking. One possible solution, which your editor has tried with good results, is to buy a steamer and cut the arms off. You will have to cut away the underarm area more than you might expect, to avoid chafe when paddling. There's no need to hem or seal the raw edges except where you cut through a seam. If you don't live in a surfing area it may be easier to find a wetsuit intended for triathlon or open water swimming. Some are made in the best quality wetsuit material with 5 mm bodies and 1.5 mm arms by manufacturers such as 2XU, blueseventy or Orca. We don't have any experience of them. No doubt they are very flexible but is the outer layer is tough enough to resist the hard use of kayaking? After use, rinse your wetsuit in fresh water (no soap or detergent), dry it and hang it up on a fat plastic clothes hanger. If you keep it in a bag rather than a hanger, don't fold it or you will get permanent creases. Roll it loosely. Wetsuit boots do a good job of keeping your feet warm. Like any wetsuit, they are much warmer if they have waterproof seams and no zippers. A wide range is available, from boots with a high leg, through slippers with a very thin sole, to socks with no sole at all and which must always be worn under a pair of beach sandals or plastic overshoes. If you have long legs, big feet and a low-volume sea kayak, your bootees will need a very flexible sole. Either that, or you will have to take them off before you get into your boat. If you use footwear with laces, make sure there's nothing in your kayak which can act like a hook and stop you getting out in a hurry, for example the wingnut on a Failsafe adjustable footrest. Most sea kayakers wear ankle-length bootees with a rubber sole sewn to the bottom. Because you can't easily turn them inside out to rinse and dry, they rapidly get very smelly. Drop in a cake of ordinary bathroom soap, squish it around a few times, rinse and dry thoroughly. Age 10 Shorts, a wool pullover and a cagoule. Surfing, winter. I used to go blue and be unable to get out of my kayak without help. Kids are tough. But not that tough. Age 12 Spartan wetsuit, non-waterproof seams, no boots. Freezing, freezing cold in winter. Age 18 My first good wetsuit, a 4mm steamer with waterproof seams. Fantastic for winter surfing, with boots, a helmet and a cagoule if it was snowing. Age 25 Two-piece neoprene membrane drysuit. Good for sea touring. The flexible fabric was less work for paddling. Not breathable, but you could take the jacket off during lunch to let the condensation out. No longer made, but see below. Age 30 One-piece PVC membrane drysuit. Not good. Not breathable. Damp clothing and actually wet socks by the end of a daytrip, just from the condensation. Age 35 One-piece Gore-Tex drysuit. Nice, but also so expensive that I used to worry about getting it damaged or dirty. Age 40 No more fancy stuff! Back to basics - a good long-john wetsuit with a drytop over it. Or if that's not necessary, some combination of thermal underwear, fleece and a drytop. Good value, flexible, reliable. Courtesy of Murty Campbell, there are on this website quite a few photos of Stornoway Canoe Club. They are based in the Outer Hebrides of Scotland. The sea there is cool rather than cold, but the weather is very often cold and windy and many of them wear drysuits with synthetic woven or fleece clothing underneath. Many cool-climate kayakers wear a drysuit in winter, especially if they are instructors. A dry top is just a fancy kayaking jacket, but the user of a full drysuit needs to be a little careful. Diving drysuits. You don't want one of these, and here's why: Some cold-water divers wear drysuits made of neoprene foam, which look just like wetsuits but have waterproof seals at the neck, wrists and ankles and a special waterproof zipper. Neoprene foam drysuits keep you warm in cold conditions. Other divers wear drysuits made from a thick, tough waterproof membrane which has no thermal insulation, so in cold waters they wear a bulky insulation suit underneath. Diving drysuits have valves to release air trapped inside the suit. 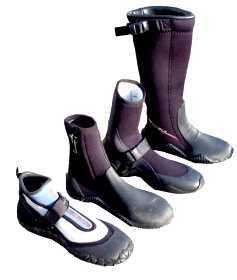 Both kinds are good for divers but not for kayaking because they're too stiff and bulky. They prevent free movement of the shoulders, and the foam suits are much too hot for kayaking. Surface sports drysuits. Dinghy sailors, windsurfers and kayakers also wear membrane drysuits, but they're made from a thinner, lighter fabric that allows free movement. 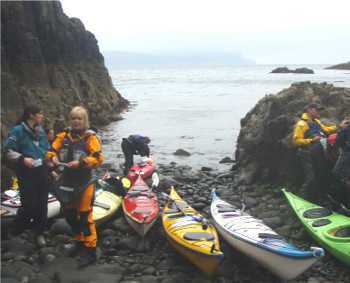 Kayaking drysuits are usually made of the same fabric as a waterproof jacket. See Breathable & Non Breathable Fabrics. Non-breathable suits are OK but your clothes will feel clammy by the end of a day's kayaking, and your feet will be wet with condensation. A new Gore-Tex drysuit doesn't even have that problem. Fantastic, you can spend all day in big surf and finish dry and comfortable. So what are the disadvantages? The small problems of drysuits: Good drysuits are expensive; a lightweight, flexible suit won't stay completely waterproof for more than a few years of regular use; the very expensive zipper can fail altogether if you're too rough with it; many owners find it necessary to use special products to keep the zippers moving freely and to protect the neck, wrist and ankle seals (or gaskets); and the seals will have to be replaced at intervals, which is expensive. The seals can last anything from six years to six months depending how much sunlight, oil, dirt, use, care and maintenance they get. That rainbow film you see in the surface of your local harbor will melt your seals, and sweat and sun lotion won't do them any good either. A cigarette end or a spark from a beach campfire will melt a hole in your suit; one-piece drysuits with the zipper at the back can be impossible to get in and out of without help; and if your drysuit isn't designed to make a waterproof seal with a kayaking spray skirt, you will get quite a lot of spray or actual water in the kayak. 1) If your drysuit zipper fails or you tear a major seal halfway through a trip, you'll have to do the rest of the trip wearing something about as useful as a wet plastic bag. By contrast, if you're wearing a wetsuit and waterproof jacket, they'll still keep you warm even if a zipper fails or one gets ripped. 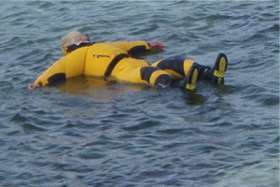 2) A drysuit can kill you, or at least immobilize you in the water so you can't self-rescue. Imagine trying to swim in a pair of waders - difficult, huh. Now imagine trying to swim in a flooded drysuit, or a drysuit with air trapped inside, all of which has rushed into the ankles so you are now suspended upside down in the water. And under your drysuit? If you're James Bond, you can wear your drysuit over a tuxedo. Our guideline is that kayak clothing should keep you fully functional during a 15-minute immersion. To meet that, underneath your membrane drysuit you need to wear thermal clothing. A scuba diver's "woolly bear" suit would be too hot and bulky for kayaking, but you can wear synthetic base-layer pants and pullover, plus bib pants made from thick synthetic fleece, and in winter a thick fleece pullover. See Synthetic Fleece Materials. Whatever combination of thermal clothing you choose, it's well worth trying it at the beach before you bet your life on it. Fashionable synthetic fleece clothing may be squashed as flat as a pancake by water pressure. One-piece drysuits have an expensive, bulky, semi-rigid zipper, and it can be a little awkward to get in and out of them. Which is why some suits have a separate zipper at the crotch or seat so you can have a "comfort break" without taking everything off. Two-piece drysuits made for dinghy sailors are great for sea kayaking. When you land on an island, you can easily take off the jacket and let your thermal layers dry out while you explore on foot. Two-piece drysuits consist of a pair of waterproof bib pants, including latex rubber socks and held up by straps over your shoulders, and a waterproof jacket which is like any other kayaking jacket except that it has a broad belt of thin latex rubber round the waist, attached at one edge. There is an identical latex belt round the waist of the pants, and you can make a very efficient waterproof seal by rolling the belts together into a thin sausage and covering that with a nylon belt. No drysuit zipper. After putting on a drysuit, and before your put on your PFD, get the air out. Hold the neck seal open with your fingers while you go down into a sumo wrestler crouch. Air will rush out of the neck, you will look less like the Michelin man, and you won't end up floating helplessly upside down if air collects in the legs while you are trying to swim. Alternatively you can grab one of your friends, inflate his drysuit, climb astride and paddle him around like a beach toy. Try swimming in your drysuit. If you find afterwards that you are carrying a lot of water in external pockets or in external reinforcing panels, it may be a good idea to make drain holes in the outer layer of fabric. We were interested to see in 2010 that Typhoon, the world's largest manufacturer of drysuits, had gone back to using cuff seals made of single-lined wetsuit material for surface sports like sailing and windsurfing. Neck seals are usually too tight at first. You can enlarge the hole with a pair of scissors but first try stretching it by inserting a bottle the same diameter as your neck and leaving it for a week. Latex seals can easily rip right across if you nick the edge with a fingernail or other sharp object. They have to be carefully rinsed with fresh water after use, and dusted with talcum powder or French chalk. Seals will last longer if you apply a protective liquid such as Seal Saver or 303 Protectant a couple of times each year. Available from a kayak or dive store. See Retail Outlets. Never allow a silicone product to get onto your drysuit, because it will make it impossible to replace the seals or carry out repairs. Some say that kayak instructors should never wear a drysuit because they will not notice that members of the group are getting cold. Then again, an inexperienced kayaker uses an inefficient paddling technique which keeps him warm by burning a lot of energy. If the instructor does not wear a drysuit he may be the only person who is cold. It is important that the instructor is alert and happy, despite spending perhaps 30 hours a week in a kayak. "My [sealskin] gloves were brand new and had been copiously soaked in blubber to make them waterproof. This made them very sticky, and as I passed the paddle through my hands it would sometimes stick, thus breaking the rhythm of the motion and almost upsetting me". Kayakers usually avoid wearing mitts or gloves but they can be nice when the sea temperature drops below 45°F (7°C) or the wind gets up. Gloves are generally not as warm as mitts. Watersports gloves usually have leather palms for grip, and backs made of thin single-lined wetsuit material for warmth. Gloves and mitts both reduce your feel for the paddle shaft. You could try pogies. These are waterproof envelopes which you attach to the shaft of your paddle in winter, using velcro. To use, you insert your hands into the open ends and grasp the paddle shaft. There is nothing between hand and shaft. Some are made of basic waterproof nylon fabric, others of thermal stretch or wetsuit material. They're quite easy to make at home. We avoid pogies lined with thick fleece because they pick up about a pint of water every time your hand dips into the sea. As long as you stay in the kayak, you are in a sheltered environment up to the chest and will lose heat mainly through your head, neck and wrists. A warm hat and a tubular scarf (also called a headover, a neck gaiter or a snood), both made of thin synthetic fleece, take up very little space and make an amazing difference to your warmth and comfort if the wind gets up or the sun goes down. You may prefer a helmet to a hat. See below. In winter surf you may want a surfer's hood made of thermal stretch to wear under your helmet. Contact lenses work pretty well at sea, even for surfing. Hard contact lenses sometimes get blown out in strong winds. Soft lenses are better. The really thin "daily disposable" and "weekly disposable" kind will usually stay in even if you open your eyes underwater. Except on a calm day the lenses soon get spattered with salt spray, which means that your vision is soon obscured by salt crystals. Except for wraparound styles, they usually fall off if you have to roll your kayak. Surf and sailing shops sell retainer cords so you don't lose them. There's a lot of glare out on the water, and it's often good to wear a hat with a peak which shades the eyes, or sunglasses if you don't mind salt spatter. Wrap-around sunglasses with polarising lenses are nice when the water is clear because they let you see through the reflections on the surface. The Inuit used to make snow goggles by cutting horizontal slits in an opaque sheet of bone or similar material. We wondered if looking through a narrow slit would also have helped them see small distant objects, on the same principle as a pinhole camera. However this seems to work only if you squint through a small round hole. If your vision is less than perfect, you can benefit from this while kayaking. Press your thumb against your index finger so as to leave a small gap. Peer through it with one eye, and you can often make out the buoy or feature that was puzzling you. Whitewater kayakers need to wear helmets in case they hit a rock while upside down. For sea kayakers, is it worth having a helmet, or could you just use a hat that will easily stuff into a pocket when not in use? Impact resistance. If you love going up narrow gullies and into caves, and surfing over reefs, you may be glad of a helmet on quite a calm day, as in this picture courtesy of Murty Campbell. In big surf, a helmet is a very useful thing because it protects your head from impact with your paddle, your kayak, your friends or the beach. 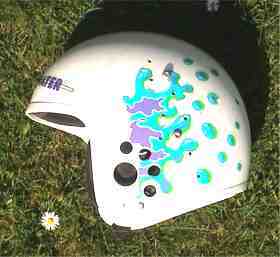 And, if your helmet is a high-visibility color, it will help your friends see that you are still present and upright. It is often worth wearing a helmet when there are inexperienced kayakers about because they concentrate so much on their own affairs that they often give somebody else a serious blow to the head. Warmth. 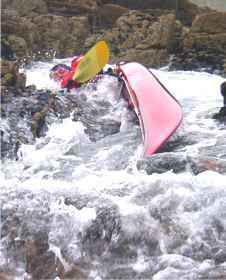 On a winter trip where there is heavy spray or a possibility of capsizing, many sea kayakers wear a helmet because it does a good job of keeping your head warm. Unlike hoods and some hats, a good helmet does not block your hearing or stop you feeling the wind on your face and neck. Design. A good kayaking helmet has a strong shell with large holes in the sides so that water can escape freely; an inner "cradle" which is in contact with your head, and an adjustable strap to go under your chin. The nine smaller holes in this one are for a video camera mounting. The outer shell is usually made of injection-molded nylon. It must be either rigid or semi-rigid. Before you buy a helmet, test it to see if it will protect you from a blow to the side of the head. Hold it with your hands on each side, where your ears will be. Squeeze them together. If they meet in the middle, we would put that helmet back on the shelf. For kayaking in a cool climate, the inner cradle should be a grid of closed-cell plastic foam. If the foam is in contact with about one-quarter of your scalp, it should keep your head warm but not too warm. There are several systems which one kayaker can use to tow a tired friend or rescue a windsurfer. Some are built into the kayak. 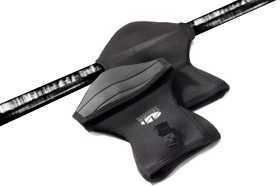 See Towing Cleat. A more popular system is just a belt made of 2-inch wide woven nylon webbing, with a nylon quick-release buckle and a small pouch with a velcro closure. A rope 30 feet long is tied at one end to a loop on the belt. The rest of the rope is chain-coiled (daisy-chained) so that it is only 6 feet long, and then stuffed into the pouch. See Knots For A Kayak Tow-Rope. If you undo one end of the chain, the rope extends to the full 30 feet. That is long enough for all kinds of tow. We recommend 7 mm to 8 mm (9/32" to 5/16") diameter high-quality eight-plait polypropylene. It floats, so you can easily find the end and it won't unexpectedly get jammed between two rocks on the sea bed. Also, it is soft and pleasant to handle. If you tie a knot it in it, it will stay knotted but be reasonably easy to undo afterwards. For example, Marstron from Marlow Ropes or Nautic from Liros. 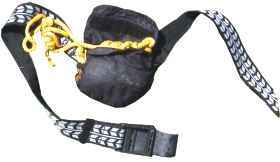 If you are making your own tow-belt, you can get a quick-release buckle from a good kayak store, or from a scuba diving store because they are used for weight belts. See Retail Outlets. The buckle needs to be compatible with the webbing. Put some webbing in the buckle, close the buckle, pull the webbing as hard as you can. If the webbing slips through the buckle it is too thin and the belt will slip off when you try to tow. Attach the rope to the middle of the belt, so when you're towing the buckle will be at the front, easy to reach. Your editor finds he can tow anything (including becalmed dinghies and once a half-ton wood raft) with just belt, buckle and rope but many top expedition kayakers like to have a stretchy section to act as a shock absorber. You can add one without cutting your tow line in half. Tie two overhand loop knots 18 inches apart and tie a short piece of shock-cord to both knots, so that when the shock-cord is not under tension it is 8 inches long. An overhand loop knot is just a Figure 8 Loop Knot with one turn fewer. Many people also like to have a carabiner or snap-hook on the end of the rope, so it can be attached quickly. Your editor has gone back to using a plain rope and attaching it with a quick-release knot. If you prefer a snap-hook you can get one made of nylon or stainless steel from a marine supply store. See Retail Outlets. A steel hook works much better but makes the rope sink, so you need to add a plastic float as well. If you are already a whitewater kayaker, probably you have an aluminum carabiner on the end of your tow line. If you use it on the sea, wash it in fresh water afterwards or it will corrode solid. • It makes a good "tail" for an inexperienced kayaker in a kayak less than 16 feet long, who is getting tired because he can't go in a straight line. If you take off your tow-belt, attach the belt to the back of his boat and let the rope trail in the water behind him, the drag will help him keep going straight. • If the only convenient access to the water is a high vertical ladder, you can use a tow-line to lower your kayak down to the water before you climb down the ladder and get in. Tie one end to your kayak's stern loop and lower it down vertically, front end first. • It makes a great washing-line.